Application: M5 and M6 swing chain connection. Offer your customer an additional option. Upgrade existing swings quick and easy. Suitable for 5 and 6mm chain. 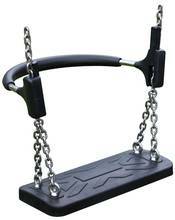 Can be mounted on existing swing chain without any disassembly. Mandatory requirement as per EN1176 for contact swings/hexagon swing arrangement. On Standard two swing frames, it can advantageous be used to achieve opposite jump off direction. The advantage being that you achieve an added safety, meaning you avoid that the children jump off simultaneous, with the risk of hitting each other.